How many times in our lives – at work or personally have we known that something isn’t quite right be it about a particular situation, a business transaction or a person and yet we have chosen to be willfully blind. 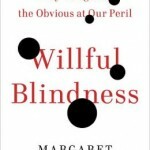 According to Margaret Heffernan in her insightful and engaging book, “Willful Blindness” – why we ignore the obvious at our own peril, this is far more common and pervasive than we would possibly care to think about. With real case studies, she answers questions like, why do we choose to keep ourselves in the dark, what are the forces at work that make us deny the big threats staring at us in the face and not heeding the warnings and why as individuals, companies and countries we regularly look back in the mirror and howl: How could we have been so blind? Here are twelve factors at play that she covers in this highly recommended book. 1) Affinity and beyond – familiarity does not breed contempt. It breeds comfort and a sense of safety. Madoff’s crime is described as an affinity crime, preying on people like him who knew others like themselves, who didn’t ask questions because their level of comfort was so high that they felt they could take shortcuts. Our blindness grows out of the small, daily decisions that we make which embed us snugly inside our affirming thoughts and values. We think we see more but in fact the landscape has shrunk. 2) Love is blind – we blind ourselves to inconvenient or painful facts. Because our identity and security depends on our loved ones, we don’t want to see anything that threatens them. It is easier to be blind than deal with uncomfortable feelings. Neuroscience shows that love activates those areas of the brain associated with reward such as food, drink, money or cocaine. The chemical processes stimulated by love disable much of the critical thinking about the loved one. There is the paradox of blindness – we think it will make us safe even as it puts us in danger. We make ourselves powerless when we pretend not to know. 3) Dangerous convictions – Psychologist Anthony Greenwald called this the “totalitarian ego.” It operates like a police state: locking away threatening or incompatible ideas, suppressing evidence, and re-writing history, all in the service of a central idea or self-image. 4) The limits of your mind – Focused attention on one thing, to the exclusion of everything else – cognitive fixation or tunnel vision – is a typical performance effect of fatigue. The mind also has its limits. As Psychologist Daniel Gilbert explains, resource depletion specific ally disables cognitive elaboration. Because it takes less brain power to believe than to doubt, we are, when tired or distracted, gullible. 5) The Ostrich Instruction – We see what we want to see and don’t see what we don’t want to see. So how can we fix a problem that we refuse to acknowledge? Are we opting for knowledge or ignorance? 6) Just following orders – Psychologist Stanley Milgram noted that when the individual is working alone, conscience is brought into play. But when working within a hierarchy, authority replaces individual conscience. He merges his unique personality into larger institutional structures. 7) The cult of cultures – under social pressure, most of us would simply rather be wrong than alone. Competitive environments seem to exacerbate conformity. Uncomfortable feelings of social exclusion and physical pain arise, in part, from the same regions of the brain and the same neurochemicals that regulate physical pain also control the psychological pain of social loss. 8) De-moralizing work – when we care about people, we care less about money and when we care about money, we care less about people. Our moral capacity may be limited in the same way as our cognitive capacity is. 9) See better – Collaboration between two different thinking style, questions and challenges to a problem and common purpose can lead to inspiring outcomes. Unearth the unmentionables. Ask more disagreeable questions. Question the unquestionable. We need to develop two critical habits: critical thinking and courage. 10) Bystanders – collectively we become blind to events that, alone, we see readily. 11) Out of sight, out of mind – why do we build institutions and corporations so large and so complex that we can’t see how they work? We cannot find our way out of these labyrinths and we are blind to the blindness these complex structures necessarily confer. So we forget all about it. 12) Cassandra – in Greek mythology – Cassandra had the gift of prophecy but no one would believe her. The world is full of Cassandras, individuals whose fate it is to see what others can’t see, who are not blind but compelled to shout their awkward, provocative truths. What you do matters. Margaret Heffernan finishes the books saying that – as all wisdom does – seeing starts with asking simple questions: What could I know, should I know that I don’t know? Just what am I missing here? If you read only one book, the next quarter, make it this one! Individuals and organizations, both, will be better off for it. Jasbindar Singh is a business psychologist who works with business leaders to sharpen their levels of self awarness including uncovering blind spots. This entry was posted in Awareness & Consciousness, leadership, Organization culture, Personal development and tagged awareness, blind spots, leadership, organisation culture. Bookmark the permalink.